What is another word for manipulate? 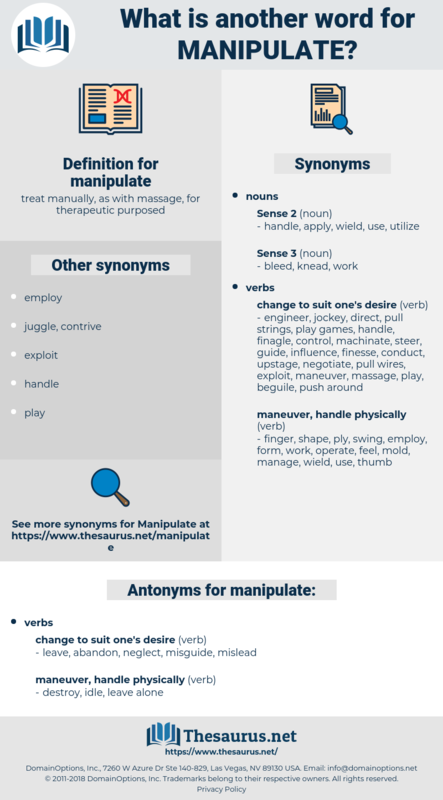 manage, sway, tamper, rig, maneuver, modify, amend, treat, manoeuver, influence, utilize, control, adjust, deceive, massage. leave, abandon, neglect, misguide, mislead. If only she could influence certain minds - could manipulate conditions. muffled, mobulidae, mobility, minefield, movability, monoploid, manifold, money belt, mine field. fiddle with, lay hands on, manage, work, rub down, massage, wield, toy, knead, ruffle, shuffle, play, twiddle, fiddle, control, operate, tamper, mouse, monkey, mix, diddle, handle.